I give exactly zero fucks about that other Ben Affleck news released today, but this is interesting. Afleck, who you probably know was hired to adapt King's monumental PA tome The Stand into two flicks for Warner Brothers - and who recently hinted that he was having trouble figuring out how to do that - has left the project. The writer/director of Crazy Heart and the upcoming Out of the Furnace has been called in. Since Affleck's last few directorial efforts have been pretty stellar, I was actually curious to see his work on The Stand. Ah well, I guess I'll ignore him as a superhero instead. I'm not quite sure what was Bens issue, I'm not a Affleck watcher either. I would think you read the book maybe also see the 94 miniseries to see how it was done, maybe even talk to King get his thoughts and go from there. The Stand simply wont work ad a 90 to 120 minute movie. I hope the WB realizes that. 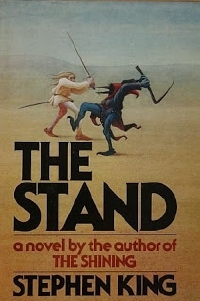 The Stand will only work as a mini series and fans will judge as modern remake by 1994 miniseries. That you need to keep in mind. I'm frankly not hopeful.